← Passionate about Ponies (G4 edition)! 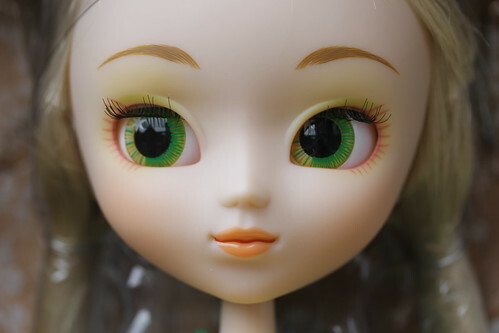 Although I have been neglecting to blog the arrival of new Pullips, it does not mean they haven’t been arriving; I’ve just been so woefully behind in blogging them I didn’t know where to start so I have finally decided to start blogging them in a random order. Today’s subject is Regeneration Paja, Re: Paja as I call her is a part of the Regeneration line that Groove has been putting out this year where they release new updated versions of beloved older releases. 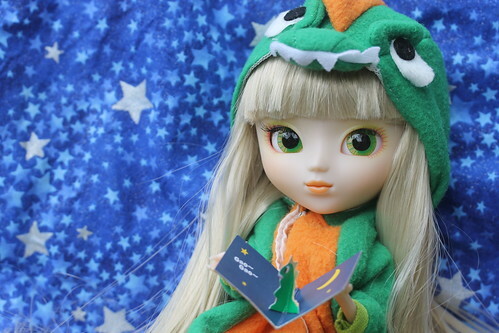 The original Paja was released back in May of 2005 and is one of my personal favorite pullip releases. Regeneration Paja box shots, she comes with same accessories as the original Paja except with an updated stand and card. Stock quality? 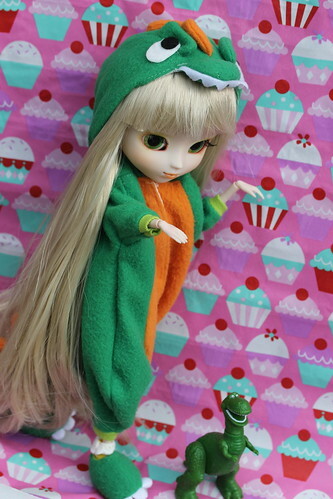 Maybe I got a bad one but one of the eyes in the dinosaur costume fell off shortly after I deboxed her all the eyes are in intact on my older Paja’s stocks and I had to reglue it. 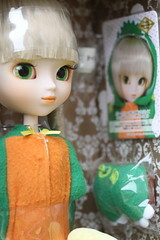 Face up comparison between the original release of Paja and the Regeneration version of Paja. I have somewhat mixed feelings about the Regeneration series, they are pretty dolls but don’t seem to have as much personality as the originals. I will say Paja is my favorite of the Regeneration series and she is definitely the prettiest. 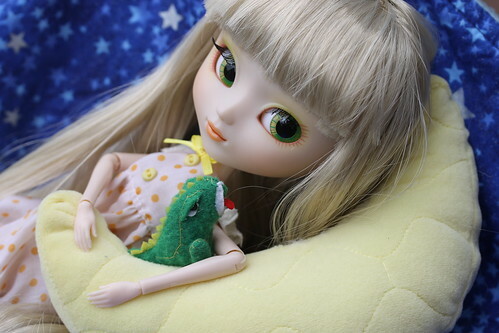 Re:Paja with her pillow and dinosaur plush, I never actually realized that the plush and the pillow were connected on the original as all of my original Pajas that came with their stock arrived came with the pillow and plush as separated items. The stock is the same as the original which means the much slimmer type 4 Re:Paja kind of swims in it. 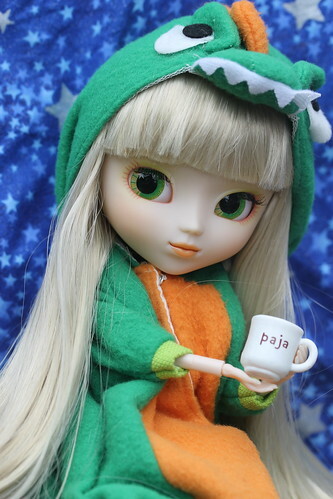 Re: Paja with a Rex toy from Toy Story because dinosaurs need to stick together. 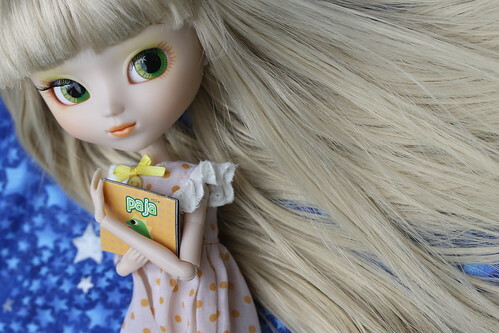 I actually ordered two Pajas as I wanted to keep one stock and I split another with a friend of mine so I could have one to rewig and play with a bit. 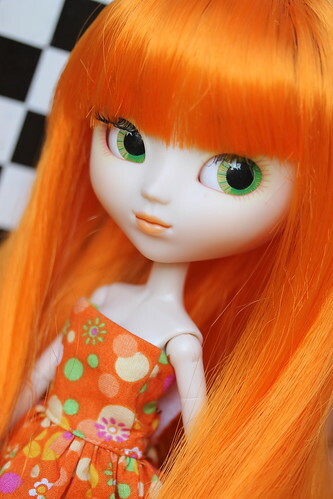 I named the other Re:Paja Anja and rewigged her in an amazing orange wig I had acquired via trade a little while back. 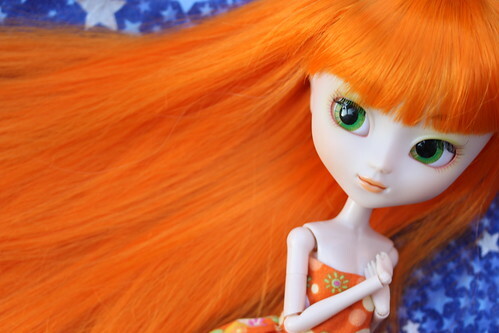 This entry was posted in Doll, Pullip and tagged paja, Pullip, regeneration, regeneration paja. Bookmark the permalink. I was hoping someone would take a side-by-side shot with the original, thank you for the pic! Will you make more pics with both of them? 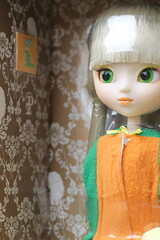 Or from more Regen+original dolls? 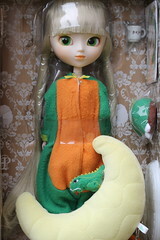 And I bought my original Paja NRFB and clearly remember that the little dinosaur was sewn on the moon pillow. But like everybody else (apparently) I took it off as well. I have comparison shots of Noir, Anne and Alice as well as Paja here: http://www.flickr.com/photos/pullip_junk/sets/72157631537885829/ ; I never got around to doing a Moon comparison shot it is on my to do list still though, I refuse to take a Fan versus Re:Fan shot out of principle. Photographing the Fans together had been on the to do list but I had a ton of people pester me about it to the point where people were commenting on every other I happened to upload around that time OMG NO FAN PICS YET???? so I finally decided not to do it as I got so frustrated by the entire situation ^^; . 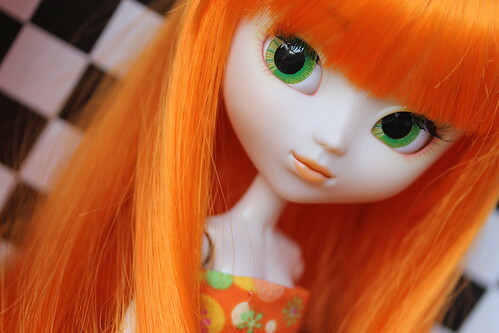 Unfortunately lately I haven’t had much time to devote to doll photography, on a good day I might have 15 minutes of free time during daylight hours to do photos in the end it was starting to stress me out more than it was worth so I have not been photographing them in general. So for right now I am focusing more on quicker photo subjects like the MLP as they require like no set up time. 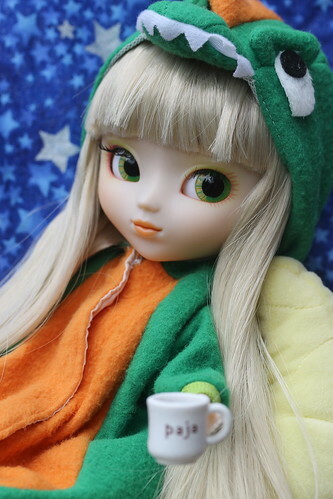 I intend to go back and do full shoots of the regens with the originals but I haven’t gotten to it yet, it is definitely on the list especially with dolls like Paja and Alice who are favorites of mine. 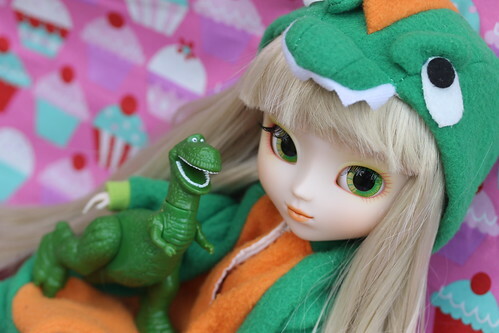 Thanks for the information on the dino plush/pillow I never had a NRFB Paja so I wasn’t 100% even though I have cycled through a couple of different sets of Paja stocks.